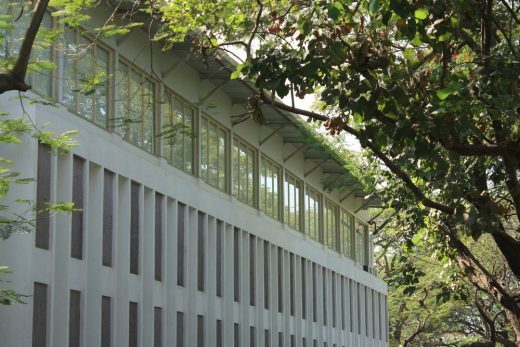 The Central Library of IIT Bombay is one of the India’s largest libraries of Science, Engineering and Technology. 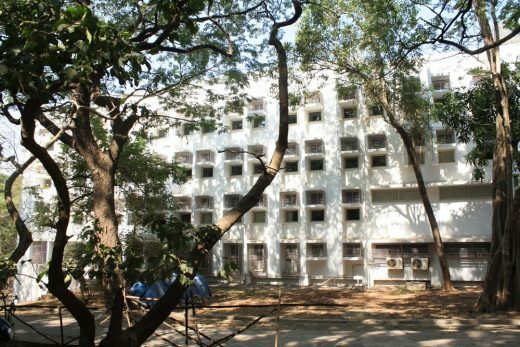 Indian Institute of Technology Bombay (IITB), Mumbai is world renowned, and India’s foremost institution of Engineering, Science, Technology and Research set up in 1958. Its educational & residential campus of more than 200 hectares is serene green island in the crowded dense city of Mumbai. IITB is declared as institution of national importance and is accorded the status of a university in India. 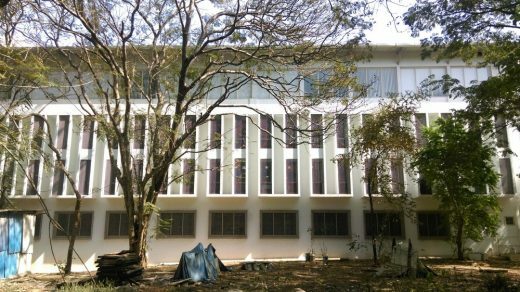 The Central Library of IIT Bombay is one of the India’s largest libraries of Science, Engineering and Technology. 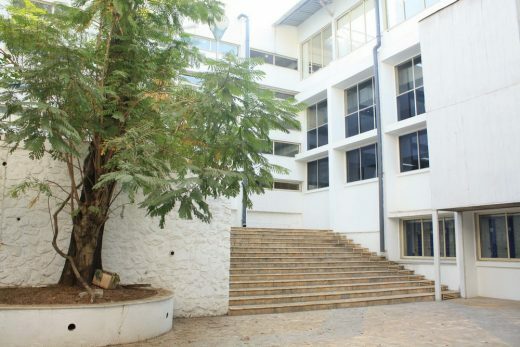 Located in the heart of the campus it is surrounded with lush greenery, the 90,000 sft building accommodates over 500000 excellent collections of physical books, journals and non-book material in science, engineering, technology, humanities, social sciences and management and same also in digital format. The requirements consisted additional space for physical and digital functions, entire renovation, repairs and interiors with furniture. 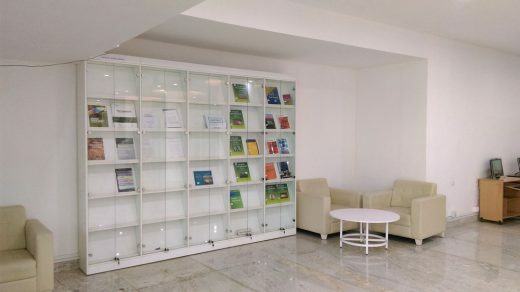 We consider the library is core of knowledge in this academic campus. So architecture is designed for inspiring environment and as a contemplative place of learning. 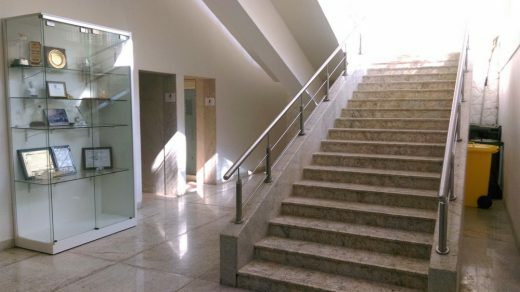 Natural light is used to make pleasant ambiance in the entire building. The extension to building is planned to seamlessly integrate with existing building both externally and internally. The entire building is redesigned as open plan and for views across the various spaces and surrounding greens including the central courtyard. Easy circulation is organized in the floors aligning the movement horizontally as a complete loop around every floor of the building (like a circumambulation path) and the loop is connected vertically at four corners by staircases. 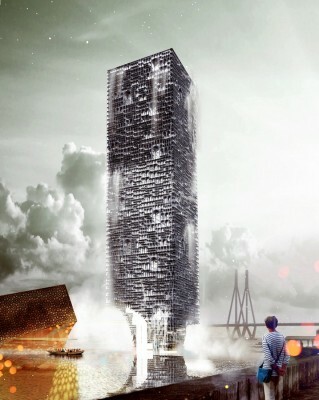 The vertical expansion at the top most floors is constructed in lightweight metal frame structure. It has external elevations with glazed walls for maximum natural lighting and external views of the landscape. All library administrative office functions are brought together. 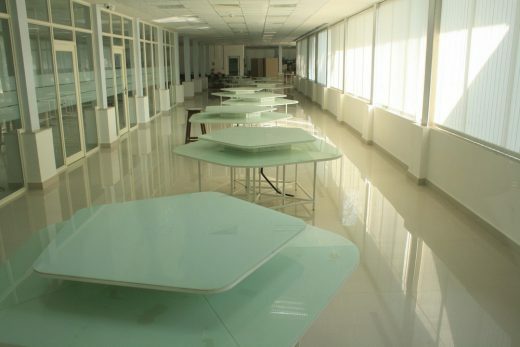 A digital knowledge lab, language lab, 24×7 reading hall, new entrance hall are added. All the existing trees are preserved, protected and additions are built around them. Care is taken that the site ecology and microclimate is maintained and enhanced. The main entrance is designed as large canopy above a glass box and added as an entry to the great institutional building. The circulation lobby is designed as a welcoming entrance hall. The open central courtyard is provided with café and landscaping for informal sitting and discussion on steps. 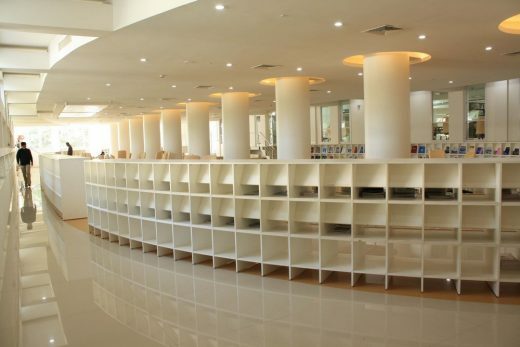 The building except entrance lobby is air-conditioned to preserve the books and create comfort conditions for the readers and visitors. The architecture & interiors is a continuous dialogue between inside & outside, between architecture & nature, between users & natural light, between spaces inside and universe outside. 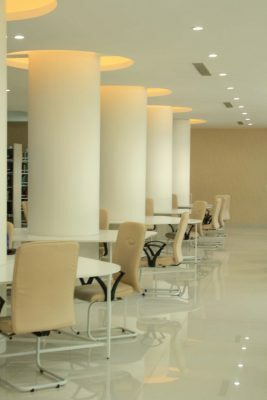 The natural light, coordinated white colour and pastel shades, textures & furniture to create calm, peaceful & refreshing atmosphere to study in concentration. 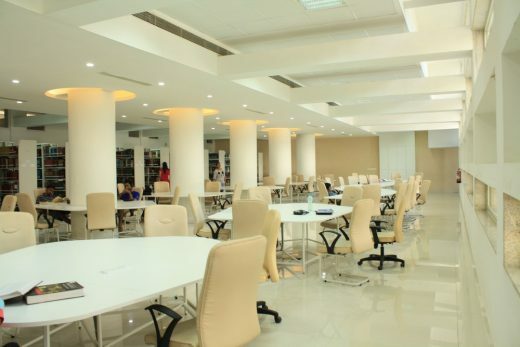 The library has become core magnet of the campus. It’s important since this project brings several ideas together right from designing with reference to site and context, learning in midst of green and openness, using light for interesting environment to saving of energy, climate and place informing design, connecting users with architecture of inside and outside and reimaging the library and its architecture in the digital age. We are continuously working to find suitable materials for architectural ideas. 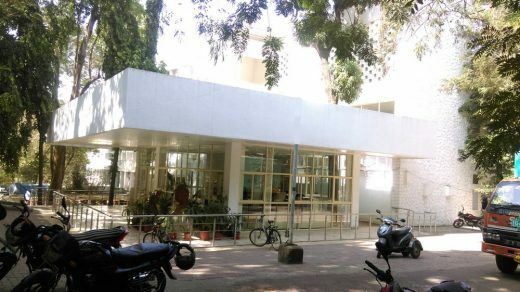 For eg in Central Library IIT Bombay we have used glass for letting in the natural light in all spaces to create pleasant and inspiring ambience. Glass has allowed us to open views to outside greenery and create inside outside dialogue with surroundings. As the seasons change the spaces get activated accordingly. Metal is used for light weight metal structure, roof and wall cladding work both internally and externally. Both materials are easy for construction and future maintenance. 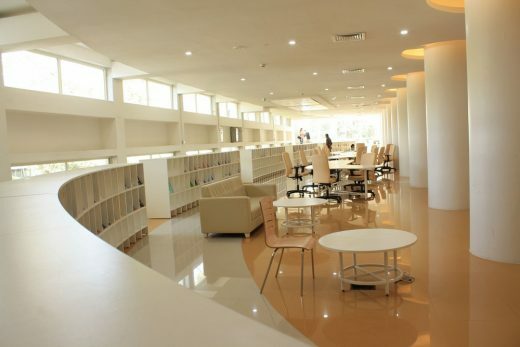 Natural Light is used in Library as main design tool which reduces energy bill of artificial lighting. The green surroundings are preserved to keep microclimate cool and reduced heat loads. 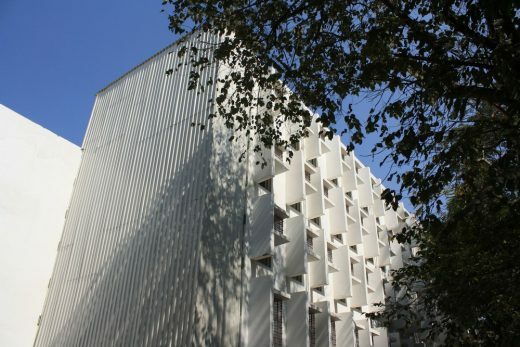 Deep shaded windows, large overhangs for sun heat and glare protection is adopted to reduce heat loads and maximum natural ventilation for lower energy consumption throughout the life cycle of the buildings. Profile of our company and architect profile. Sanjay Udamale Architects is a multidisciplinary architectural design firm offering one point integrated comprehensive architectural design consultancy services for construction projects: Architecture, Master Planning, Interior Design, Heritage Conservation and Green Building Design. 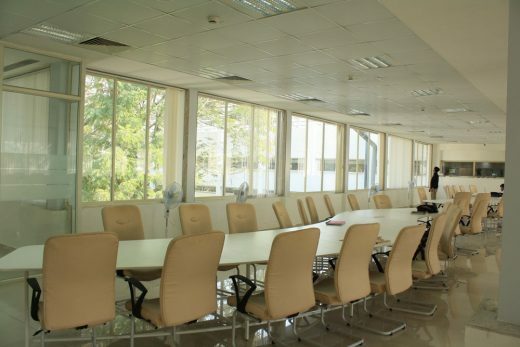 This includes wide range of projects from Office Buildings to Commercial Complexes, Housing Townships to Cultural & Academic Institutional Campuses, Urban Design to Heritage Conservation and Interior Design of Offices, Institutions to Private residences. Their every project is to create architecture, design & engineering in response and respect to users and communities, place & people, context & culture, land & environment, economy & technology, city & sustainability, arts crafts & celebration in a sensitive unified system. 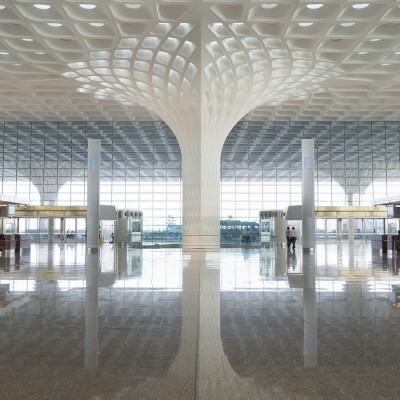 Sanjay Udamale is a practicing Architect in Mumbai. He studied Architecture at the Sir J. J. 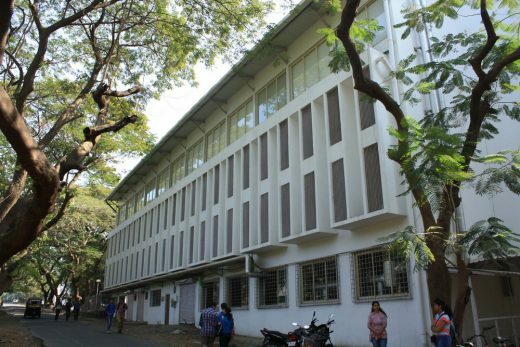 College of Architecture, University of Mumbai (88-93). Some of his works are Indian Navy’s HQWNC –Western Naval Command Headquarters, Mumbai; Indigo Waterfront Housing Complex, Palghar; Housing & Multipurpose complexes for Indian Armed Forces; Renovation, Extension & Interiors of Central Library, IIT Bombay. His works include the integrated urban design, renewal and master plan of all 15 lakes and Masunda lake waterfront of Thane City, Alternative plan for Thane Ring Railway, “Urban Heritage Conservation of Kalyan City” for conserving the entire architectural and natural urban heritage (85 structures & sites) of historic Kalyan near Mumbai. He led and worked on the project “Housing in Kutch” which received the JIIA award from Indian Institute of Architects for Excellence in Architecture. He is author and designer of the book “Architecture for Kutch” based on this new housing design, its construction, passive energy efficient climate responsive sustainable design, architecture, arts, crafts and culture of Kutch region of Gujarat state in India. He is also empanelled expert by BEE (Bureau of Energy Efficiency, Govt. of India) for green energy efficient architecture. Firm specialization: Architecture, Master Planning, Interior Design, Conservation, Green Building Design for Offices, Institutions, Housing, Leisure & Exhibition (galleries, retail). Firm’s full name, address, email, phone contacts and website details.